Now that was a long title! I just wanted to get all the highlights into one place. 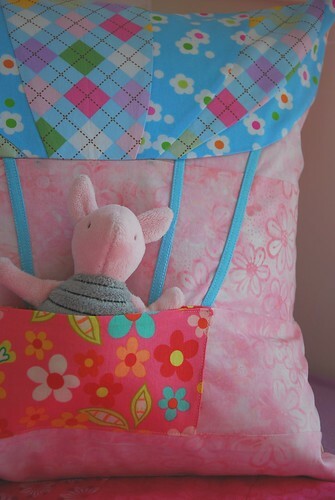 First, this is a cute pillow pattern that has a pocket. The pocket just happens to be the basket for a small friend to ride in. And, this basket is attached to a beautiful hot air balloon. And of course since I am crazy, and like writing up tutorials, especially complex ones like this one, and posting them for free access, this project comes with a self-drafted pattern and complete instructions! Enjoy! * I'd say a very advanced beginner sewer should attempt this. (That being said, for ambitious beginners with a passion for learning new skills, this is a great project to explore sewing curves.) Those of you out there who have far more sewing experience than that, this should just be a fun project. * What do I mean by advance beginner? You'll need to be able to sew curved seams that lay flat, or at least have the time to try them out, (you'll be glad you did) and you'll need to be familiar with pattern notations. There are quite a few curves in this project and some involve more easing than others. I give a number of tips about doing these curves here in this tutorial, but for more learning and a visual, Google drunkards path quilting, or sewing curved quilt seams videos. As for pattern notations, you'll need to be able to transfer pattern notations and follow my instructions about how to use them. *I am not a quilter. I am a garment maker. 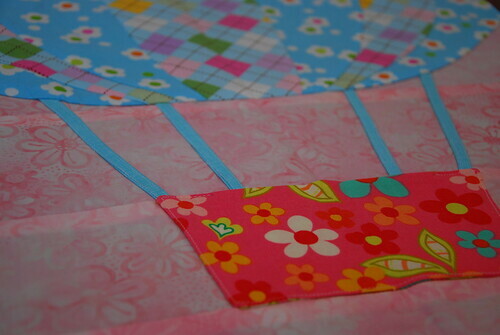 So, this patchwork-style project is just that...a "style" project. 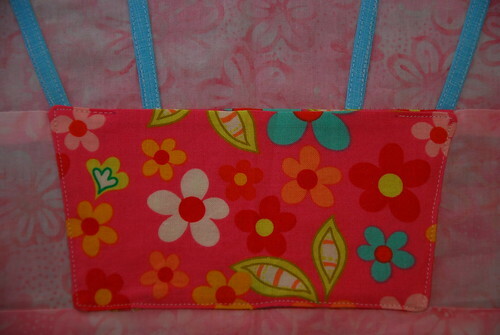 Some parts are patch-worked together because I designed a single layer of fabric for the pillow facing. Some of my methods are a little non-traditional when it comes to true quilt-patchwork, but bear with me. The project turns out lovely in the end. * And finally, this pattern transports a small friend who is approximately 3" wide by 6" tall. Or, it could carry a gift card to your favorite baby gear store too. 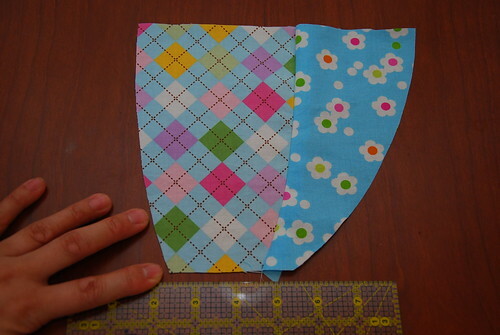 * I am making this particular pocketed pillow for a friend who is having a baby, VERY soon. I guess the pillow is really for the baby, not the friend, but you get what I mean. Anyway, this little soft accessory makes a great baby shower gift and when constructed from quality cotton fabrics, is also a sweet heirloom-type gift. I hope my recipient likes it very much! 1. Wash, dry, and press fabrics. 2. Download and print pattern pieces. Cut them out with a paper scissors. 3. Align grain line of pattern pieces to the grain line of the fabric (they should run parallel), trace around each piece with a disappearing ink marker (or other writing implement of your choice) and transfer all pattern marks with a pencil to the right side of the fabric. 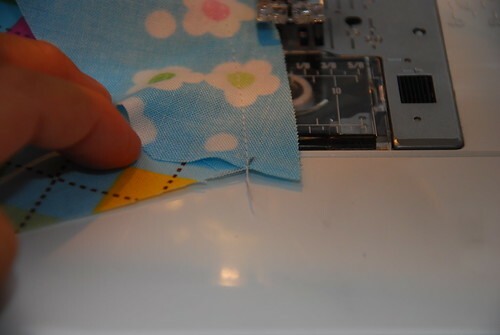 HINT: This is how I transfer pattern marks that are not along the edge of the pattern piece. 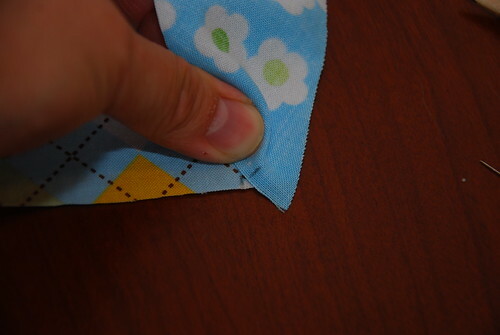 I simply, fold back the paper pattern at the notation and mark with a pencil this spot on the topside of the fabric. If your paper isn't transparent, you could use a straight pin. 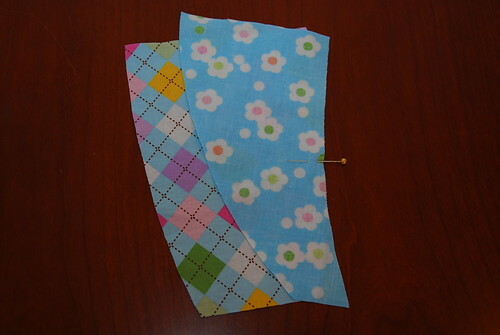 With the pattern piece flat against the fabric, push the pin tip through the pattern paper into the fabric below. 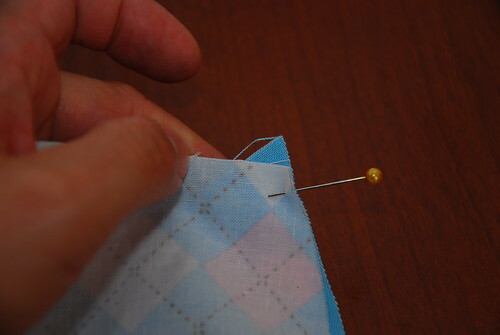 Lift the paper pattern and mark the dot where the pin is sticking into the fabric below. (1) piece of Sky (G) (there is no pattern piece #1; this is number one) that measures 3 1/2" X 17"
4. Lay the #9 Middle Balloon piece right side up. Overlay the right hand side #8 Balloon Stripe (A), wrong side up. 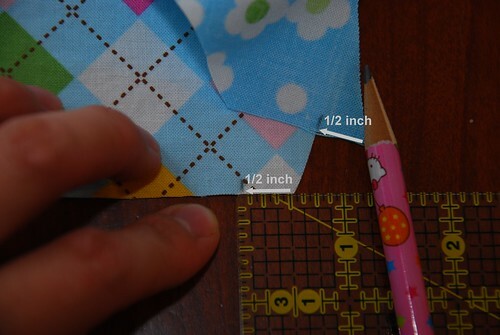 HINT: Measure and mark the 1/2" seam allowance on both pieces at the beginning and end of the seam. 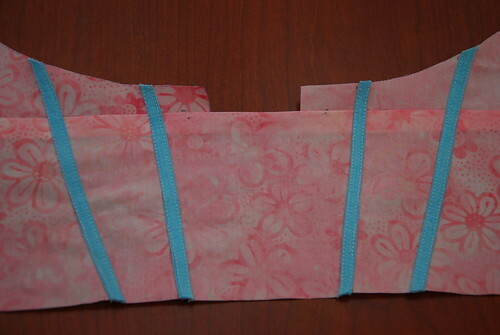 The picture above is the end of the seam on piece #9 and on right hand #8. Match the marks and pin the layers in place. These marks are where the thread should sew through allowing the pieces to open in alignment. This is the piece flipped over. Notice that there is that triangle that sticks out. This is good. The measured seam allowance mark tells you how large a triangle should be there. Start sewing in the crotch of the beginning "V" and finish sewing in the crotch of the other "V". Open the piece, make sure the top and bottom raw edges are aligned, close the piece, press the seam to one side, and trim the extra triangles flush with the rest of the piece. Presto, perfectly aligned edges, with an angled seam. So, back to the matched #9 Middle Balloon and right hand side #8 Balloon Stripe (A) pieces...Start sewing in the crotch of the "V" and continue through to the other "V". (You don't need to back stitch here, like in quilt patchwork, because the beginning and end of the thread will get caught up in subsequent seams.) Open the piece and make sure the top and the bottom of the piece are parallel. Close the piece, trim the seam allowance to 1/4", snip small cuts into the seam allowance where the fabric is curved so that both pieces will lay flat when open. Open the piece and press the seam to one side with a hot iron. The fabric will probably naturally want to go toward the #9 Middle Balloon piece. 5. Repeat this process with the left side of the #9 Middle Balloon piece and the left hand side #8 Balloon Strip (A) piece. *Go slow. Stitch slowly. Leave your needle down through the fabric, pause, lift the presser foot and check both layers of fabric to make sure that they are flat within the seam allowance. Lower the presser foot and continue on. *Pin the middle, the beginning, and the end. One layer is curved one way. The other layer of fabric is curved the other way. The one that looks like it has a bite taken out of it, or the one that is concave, is the one that "seems" shorter. This layer needs to stretch to "meet" the other fabric Don't put too many pins in, because you want to be able to work with this stretchy bias-cut fabric. Gently, and evenly, stretch the concave piece to meet the edge of the other curve (or the convex piece). Match the edges together with your fingers and gently guide them slowly through the machine. *Work to aim for those "V" crotches. This will align the edges once the pieces are opened. 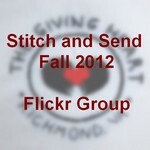 *Don't bother back stitching at the beginning or the end. If you don't like the seam at the end it is easy to rip it out and start over. *Clip perpendicular to the seam within the seam allowance along the curves to let the seam allowances lay flat behind the piece. 7. Fold one rectangle in half lengthwise, wrong sides together, and press with a hot iron. (Second mock-up from the left.) Unfold this and fold each raw edge to meet the center crease and press. (Third mock-up from the left.) 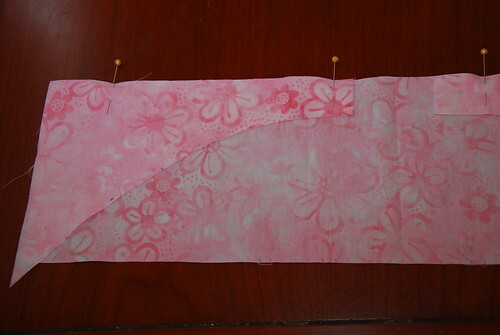 Fold the piece in half again lengthwise and press. (Mock up at the far right.) Repeat with the remaining three rectangles and then set these aside. That sounds kind of funny. And by the way, my sky is pink. 9. Match one end of one rope piece with the marks at the bottom of the #4 Sky (E) piece and pin in place, making sure that the open edge is facing away from the center line. Match the top of the rope piece with the mark on the attached #5 Sky (D) piece and pin in place. Both the top and the bottom of the rope piece should extend beyond the sky pieces. Baste the rope piece in place. Repeat with the other three rope pieces, making sure that the open edges face away from the center line. 10. Edge stitch both long edges of each rope piece and remove basting stitches. Trim the rope pieces that extend beyond the sky pieces so that they are flush. 11. 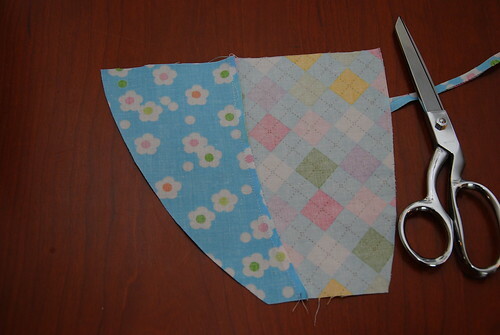 Fold the Sky piece you just finished in half, matching left and right edges and finger press the center crease. 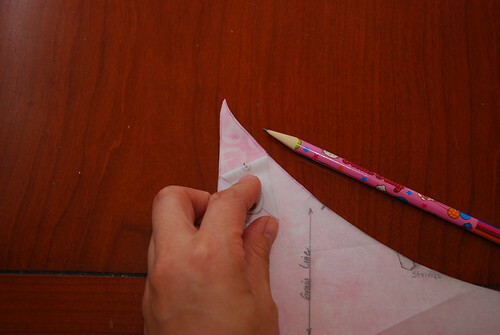 Fold the finished Balloon piece in half, matching left and right edges and finger press this center crease. Open both pieces, overlay them with right sides together, match center creases and pin. (This is going to be just like piecing the curved balloon pieces.) Remember my "sew in the crotch of the "V" hint" and how to align the curved edges to get that "V"? Do that now, and pin matched left and right corners. Match edge markings and pin. In all, there should be five pins holding together the sky/ropes piece and the balloon piece. 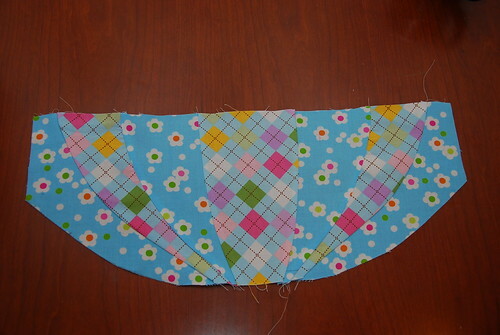 Take a deep breath, and start in the center crease of the balloon and stitch out to the side each ways. Go slow. Make it even. 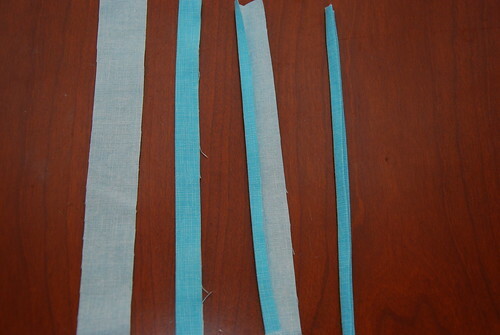 Trim the seam allowance to 1/4" and snip the curved seam allowance of the sky piece to allow it to "stretch" and lay flat around the curve and press the seam to one side. Stand back and admire for a moment, and congratulate yourself knowing that was the last curved seam. 12. Lay the right hand side #2 Sky (F) piece right side up, and overlay the #3 Basket piece wrong side up. Match edges (per my hints above about the V's), pin and sew. Trim seam allowances to 1/4" and press to one side. Repeat with the left hand side #2 Sky (F) piece. 13. 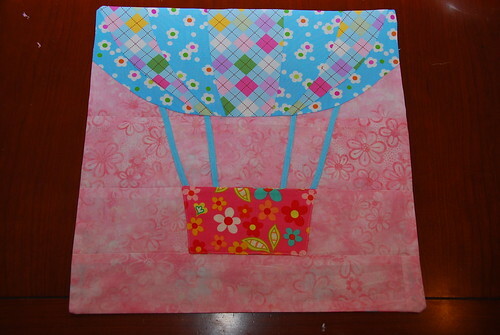 Lay the Balloon piece right side up and overlay the just completed Sky/Basket piece over top, matching edges and pin. (When the piece is unfolded, the most left and most right ropes should align with the edge of the basket piece. It should look like the ropes attach the basket to the balloon.) 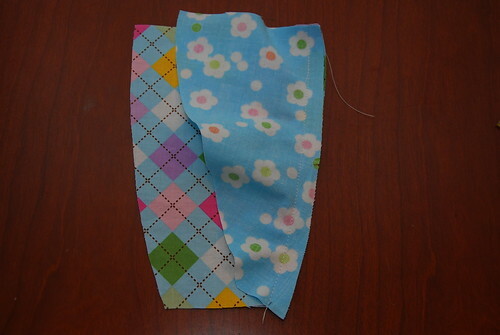 Sew, trim the seam allowance to 1/4", and press toward the basket piece. 14. Lay the Balloon piece right side up and overlay the #1 Sky(G) piece wrong side up (The sky piece for which there was no pattern piece.) (When the finished piece is opened, this last sky piece should be sewn to the bottom of the basket.) Match edges, pin and sew. 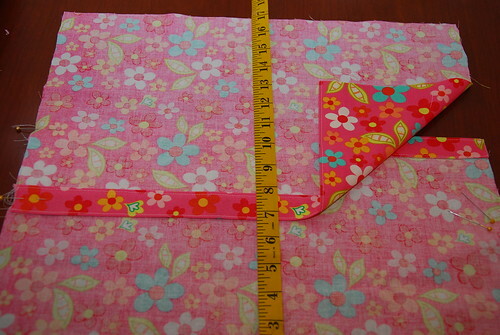 Trim seam allowance to 1/4" and press toward the last Sky (G) piece. 15. Align the two remaining #3 Basket pieces together, right sides together and pin. Sew around the basket piece, leaving a 2" opening at the bottom of the basket, back stitching at the beginning and the end. Above, you can see the 2" opening I've marked and will not sew beyond. 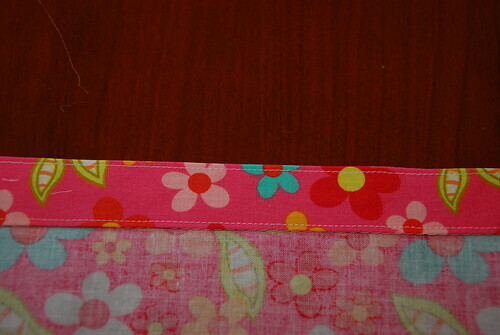 Trim the seam allowance to 1/4", trim the corners, and turn the piece right-side out. Use a pencil or chopstick to push out the corners and press. 16. Align the basket piece atop the patchworked basket shape and pin. Edge stitch around the basket perimeter, starting 1" from the top right corner, continuing down the right side, on to the bottom, up the left side, and 1" past the top left corner. Back stitch at the beginning and the end. Pour yourself a glass of something good to drink and say "cheers" the pillow front is finished! 17. On one pillow back piece, along one 17" edge, stitch 1/4" from raw edge. 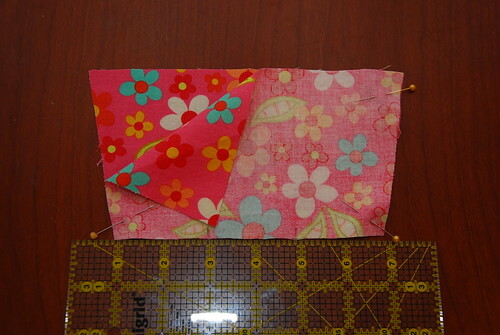 Fold wrong sides together and press along this stitch line, pin and then edge stitch. 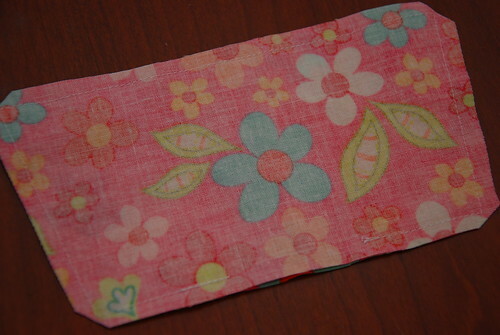 Then fold the finished edge up to make a 1" hem, press, pin, and edge stitch again. Repeat with other pillow back piece. 18. With wrong fabric sides facing up, overlap finished edges of pillow back pieces so that the total back pillow panel should measure 17" X 17". 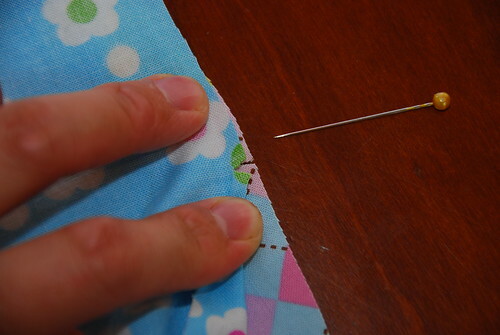 Pin, and baste each overlaped edge within the 1/2" seam allowance. 19. 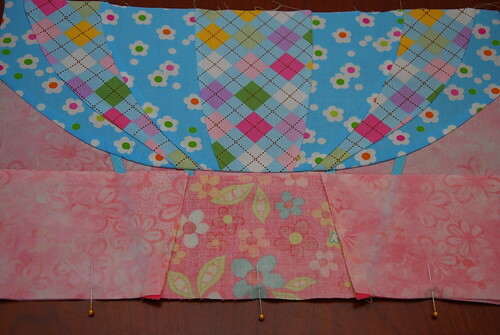 Lay back panel right fabric side up, and overlay the balloon patchwork panel wrong side up and pin. Stitch all the way around, back stitching at the beginning and the end. Trim corners and turn the work right side out through the opening in the back panel. 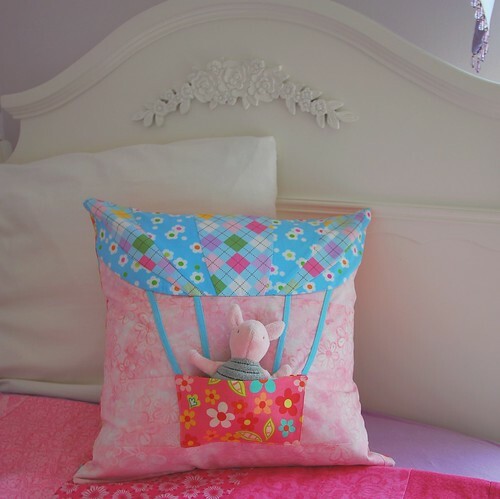 Stuff the pillow case with the pillow form and insert your favorite friend into his/her new sweet hot air balloon. If any of these instructions aren't clear, or if there is an error, please leave me a note! This tutorial is my first of its kind, (I have many more ideas I can't wait to share) and I've had it all running around and around in my head. I hope that everything came out correctly, but with a teething infant, and my sever lack of sleep, I can't be too sure. Thanks! My boys all LOVE hot air balloons, and this is so adorable. I will have to make this for their birthdays.